There are a few cruise ships that visit the Tristan da Cunha islands most years, and others that visit from time to time, usually during island hopping voyages between the islands of the South Atlantic. They normally visit during the austral summer when the weather is better and there is more chance of seeing Tristan wildlife, especially if the visit is timed to coincide with the breeding seasons. As the harbour is too small for ships to dock, passengers land in zodiacs or tenders, although sea conditions may sometimes prevent this. Very large cruise ships tend not to try to land passengers, but islanders will normally come aboard to talk and sell postcards and souvenirs. In any case, the islands and their rugged coasts are sights you will never forget. * Torbjörn Svensson is planning to lead a party from the Scandinavian Geographical Society on the Plancius cruise. See reports of recent cruises on our Cruise Visits page. This is a luxury cruise ship with state rooms accommodating up to 244 passengers. It cruises from Ushuaia to Cape Town calling at the Falkland Islands, South Georgia, Tristan, Nightingale, and Gough. 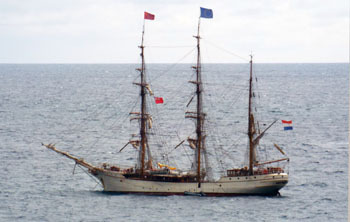 This is a training sailing ship with berths for up to 48 passengers. 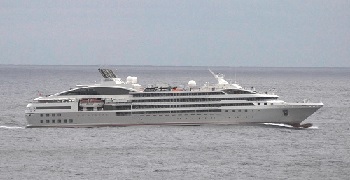 It calls at Tristan during its 'Cape to Cape' cruise from the tip of South America to Cape Town. 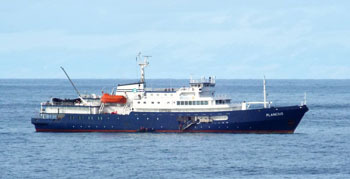 This converted oceanic research vessel accommodates up to 116 passengers. It offers cruises northwards from the islands of Antarctica to the Cape Verde Islands, calling at Gough Island and Tristan da Cunha. This is a purpose-built luxury expedition cruise ship, accommodating up to 130 passengers. It has cruises from Ushuaia to Cape Town, calling at various South Atlantic islands, including Tristan, Nightingale, and Gough.